The US Unemployment rate reported this morning gained 50bps from the previous month, and was 40bps above the economist survey of 5.1%. At 5.5%, unemployment sits at precisely the same level as the start of the December-07 expansion. Excluding the current period, unemployment declines 2.77% on average during expansions, and gains 2.67% on average during recessions. 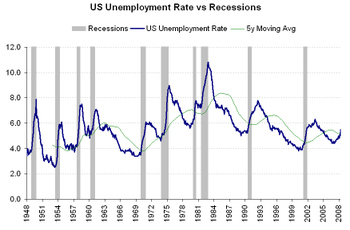 Below we highlight the unemployment rate and all recessions since 1948. It is a well known fact that the job markets within the US begin to drop when recession begins to rise. Hopefully we won't see the same unemployment rates that we saw back in the early 80's. If I am correct, I have seen two U-6 computations, and both are a bit higher than U-3. Hi thank you for an perceptive post, I actually found your blog by searching on Goole for something else nearly related, in any case before i ramble on too much i would just like to state how much I enjoyed your post, I have bookmarked your site and also taken your RSS feed, Once Again thank you very much for the blog post keep up the good work.